(Nanowerk News) Anthropogenic climate change leads to melting glaciers and rising sea level. Between 1902 and 2009, melting glaciers contributed 11 cm to sea level rise. They were therefore the most important cause of sea level rise. This is the result of a new assessment ("Past and future sea-level change from the surface mass balance of glaciers") by scientists of the University of Innsbruck. They numerically modeled the changes of each of the world’s 300 000 glaciers. Until 2100, glaciers could lead to an additional 22 cm of sea level rise. Since 1900 the global sea level has risen by approximately 20 cm. Melting glaciers are one of the causes – along with warming and thereby expanding sea water, melting Greenland and Antarctic ice sheets, and changing terrestrial water storage in dammed lakes and groundwater reservoirs. A team of scientists at the University of Innsbruck has now assessed the contribution of melting glaciers to sea level rise during the 20th century. They numerically modeled each of the world’s roughly 300 000 glaciers and used thousands of on-site measurements to validate the model results. “These calculations show that between 1902 and 2009, glaciers contributed about 11 cm to sea level rise”, says Dr. Ben Marzeion from the Institute for Meteorology and Geophysics. “This means they were the most important cause of sea level change.” Surprisingly, melt rates were more or less constant over time: While temperatures during the first decades of the 20th century were considerably lower, glaciers were larger and extended into lower and thus warmer areas. Additionally, brief but strong warm episodes in the Arctic led to strong glacier retreat in the Arctic in the 1930s and 1950s. In the climate models four different scenarios of future economic, social, and technological development were used to represent different levels of greenhouse gas emissions. “Regions with small glaciers, such as the Alps, will lose a large fraction of their ice during the coming decades”, explains the climate scientist. 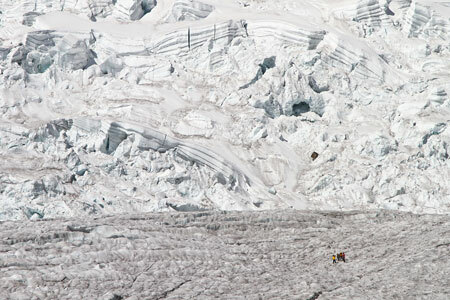 “In the Alps, half of the ice will be gone by approximately 2040. But in absolute numbers, this loss is relatively small: until then, the Alps will contribute only 0.2 mm to sea level rise.” Regions with large glaciers, however, will lose a lot of mass in absolute numbers, while a relatively large fraction remains: “In the Canadian Arctic about 70% of the ice will remain in 2100, but this region alone will have contributed about 2 cm to sea level rise by then”, says Ben Marzeion. Melting glaciers will raise the sea level between 15 and 22 cm until 2100. “Where we end up within this range is up to us – it mostly depends on how much greenhouse gas we will emit”, says Marzeion. The same is true for the longer term: “Until 2300, we can expect the sea level to rise between 25 and 42 cm due to glacier melt. With 42 cm sea level rise, most of the glaciers of the world will be gone, leaving behind only small remains in very high altitudes.” But also in the future, warming and thus expanding sea water, melting of the Greenland and Antarctic ice sheets, and changing terrestrial water storage have to be added to obtain the full sea level rise.